Move Your Feet, It’s Summer Streets! Cyclists and pedestrians on Centre St. take advantage of last summer's smaller, weaker Summer Streets. Revelers, get ready. That time of year where cars and buses are replaced with rollerblades and bikes has finally arrived. The first three Saturdays of August ( 8, 15, 22) from 7:00 a.m. – 1:00 p.m., New Yorkers can get out and enjoy the streets they work so hard to keep clean and paved. Blocked off to traffic, the Summer Streets route connects the Brooklyn Bridge with Central Park. 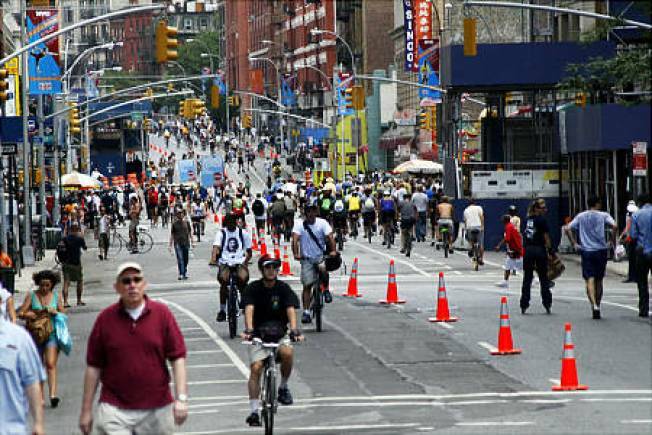 Thanks to NYC Dot and Mayor Bloomberg, this year Summer Streets is set to far exceed any other. There is a jam-packed schedule filled with activities for people of all ages. From a Kid's Latin Percussion class to an Intro to Bike Commuting Seminar, you can be sure there are interesting things suited for your all your family and friends. Relaxing remedies such as outdoor yoga is also available, namaste. Swear off driving these next few Saturdays, and pray the weather holds up. Besides, the blocked off area will cause even more congestion on other streets, but instead of cabbies and cars, it will be Treks and bladers. Mini summer streets will also take place in all five boroughs-so don’t miss out!